Welcome to Isuzu Trek Infoletter #40. We signed up for a 4-wheel weighing at the Escapees’ SmartWeigh facility at Congress, AZ in January 2017. 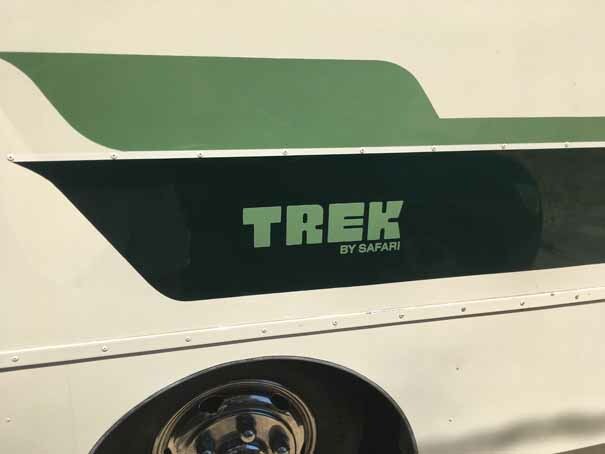 The Trek was loaded for a normal trip, including full fuel, propane, and water and empty holding tanks. The cost was $45, right on time, scheduled by appointment. The facility does not use four individual scales but instead has a level concrete pad with left and right scale segments to weigh L & R wheels separately, axle by axle. 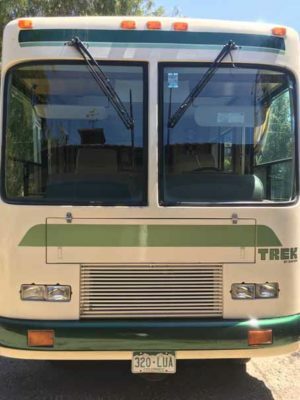 It appears that the first-year 1991 Trek – at least the 2810 floorplan – was designed without too much concern for 4-corner balancing. This model was initially much heavier on the left-hand side, with propane tank, genset, kitchen sink and cabinets, the head, and both holding tanks on the left. Additionally, the fresh water tank was largely positioned to the left side. 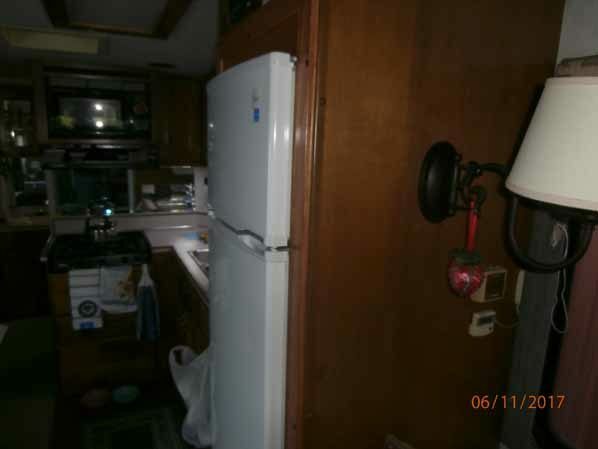 On the right side are the fuel tank, a passenger couch-bed, the frig, wardrobe, and shower. For info, I maintain 80 psig in all tires for the additional safety margin afforded. This is more than actually required for the loaded weight but I have never observed significant tire wear in the center, as might occur from over-inflation. As you can see, like Glenn we are heavy on the left, within both max axle ratings, but still ovr max gross limit of 13,250 at 14,050. We are also very close to the front tire weight capacity limit which prompted me to do what Glenn did and upsize the front tires to 235 85/R16. It must be strongly emphasized that this increase in tire weight carrying capacity does not in any way increase the axle rating, but it does increase the safety margin. 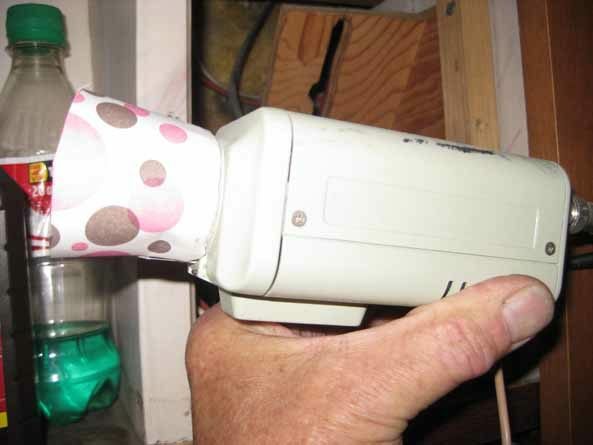 Editor’s Note: The following microwave repair is for only the folks that feel qualified to attempt a repair like this. My highly qualified appliance repair guy had this warning “Door latches and switches are very critical to the safe operation of the microwave so I would not recommend that type of fix”. My rig has the original Sharp carousel II unit. Over time the latch to open became difficult. I attached a string to inside of door to assist. Finally, the unit would not go to off position, with light off, so that I could enter cook time. To remove from cabinet, there are screws from under cabinet into the front black plastic feet, remove screws. Pull forward and unplug. To open oven, remove screws on back and side that hold cover on. Lift control panel up and it will slide out of bracket. I clipped zip ties and unplugged a wiring plugin to get room to work. Conclusion, the white square like piece that the push to open panel pushes on, in turn pushes door back open and tells unit when door is closed and its safe to start. The white piece had a foam insert, that made it fuller and in turn caused push on door to work better, that had worn away. We tried different material until we found the right tension and rebound, glued in place and so far it is like New! I used felt from car window frame. Nine years ago I spent the winter in the desert with red dirt, my dog brought most of it in and left it on the wind shied shades. The replacement shades are $200 plus, so I had nothing to lose and 200 to save. So I took them down and scrubbed with Awesome cleaner and spot cleaned with bleach. They are perfect! Why did I wait so long? 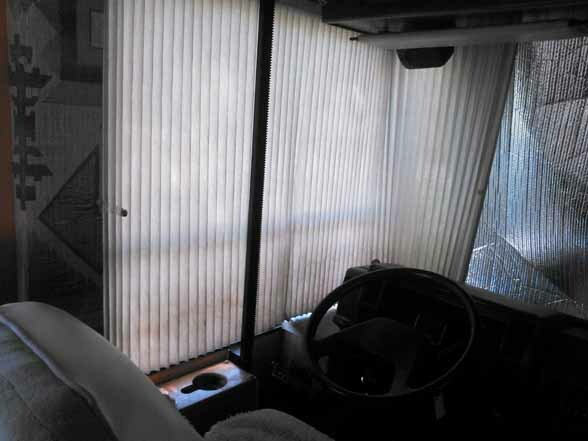 Linda Dahle 1994 28′ with rear bedroom. I have no dash air and use the generator & roof air while on the road. While driving, I cannot hear the genset, either running normally or perhaps surging so there are two plug-in voltmeters to the left of the dash panel. The first volt meter is connected to output #2 (not normally used in the Trek) and shows when the genset actually starts. The other volt meter is connected to output #1 and shows when the automatic transfer switch picks up after the warm-up delay. Output #2 is wired to a dedicated receptacle and is used with a space heater during genset load tests (or, simply to keep warm, as appropriate). I relocated the genset start/stop switch from over the frig to the cockpit. I relocated the roof air controls to the cockpit. If the genset happens to surge under load while driving, it’s quick and easy to shut down the roof air and then the genset. 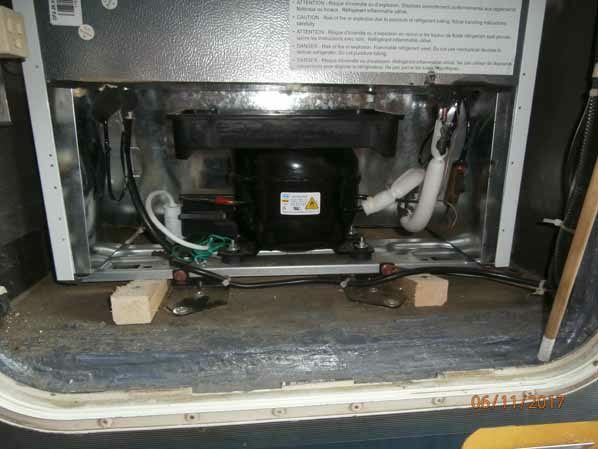 (Knock on wood – the genset has been running great. )Propane consumption can be predicted fairly accurately based upon the fuel input specs provided for each appliance. One high consumer is the propane furnace, so I connected a Hobbs hour meter to the fan control. The fan runs a bit longer than the propane ignition cycle, but this is close enough for government work. 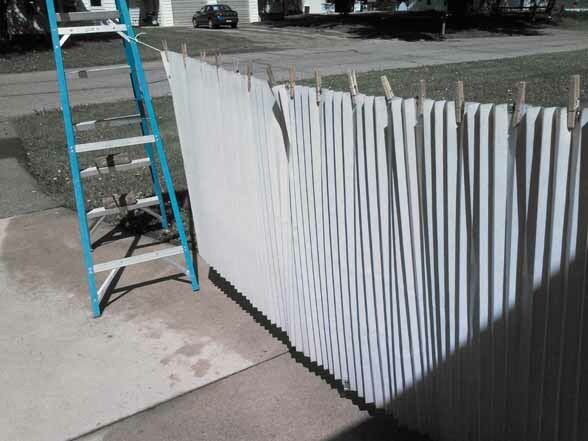 Editor’s note: Glenn travels extensively with just the dog and since she (the dog) has not yet learned the above skills he finds these modifications very useful. My heater control valve rarely functioned so replaced with generic from napa. I also had to replace the cable. I should have removed, cleaned and lubricated, exercised the original before cable no longer worked. It should move very easily. My water separator started leaking diesel. Went to Isuzu for a new O ring. 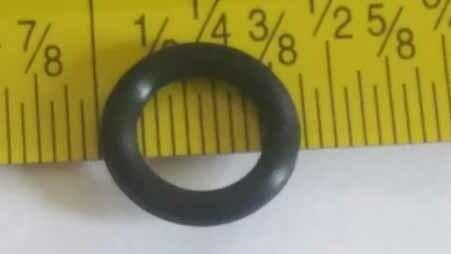 Remove plug and covered hole with my thumb while friend replaced O Ring. Ps – if you need fire starter drain separator and use the diesel. Editor’s note: I have also had this problem. Mine was due to a piece of grit and since I only opened the drain enough to dribble the diesel/water out I trapped the grit and it leaked. 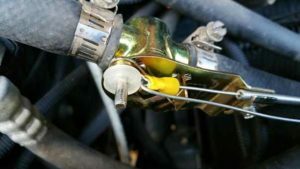 Since then I have opened the valve to allow much larger flow apparently clearing any grit resulting on no problem/leak. I recently decided to install a new house style frig & do away with the gas frig once and for all. First I removed all the screws, loosened the gas line after shutting it off first .Be careful when you cap off the gas line. I capped the line at the tee & got rid of the small length of pipe. I also removed the doors as it made things lighter for me to handle. I removed the box which went out the door…Next was simply push the new box into the cabinet where the old box was. The Avante ( energy efficient ) was an exact fit ,went right thru the doorway. Next was lining it up to fit into the cabinet so the doors just stuck out past the cabinet as the old one did. 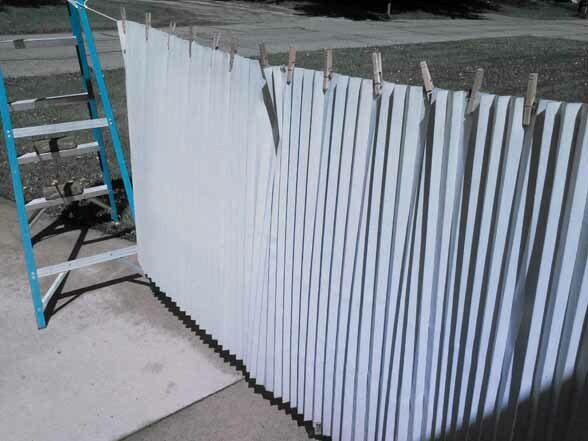 This will allow the doors to fully open up. The floor of the cabinet is not fully square to the walls so make two small wedges to tilt the frig in & out, left to right to line it all up to the front of the cabinet. 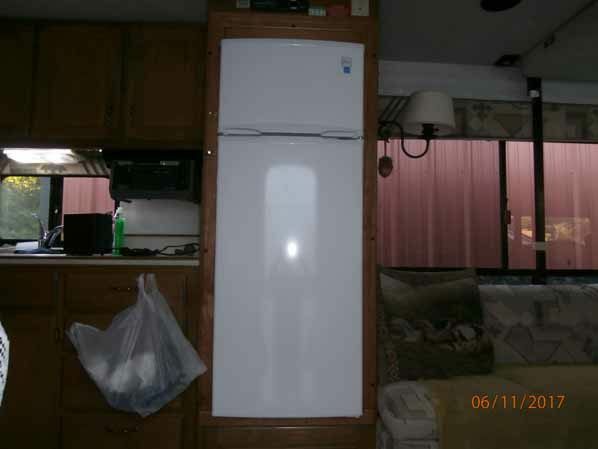 Two – l shaped brackets to hold the rear of the frig to the floor and two long screws at the front, on each side to hold everything in place. Now all you have to do is plug it in. 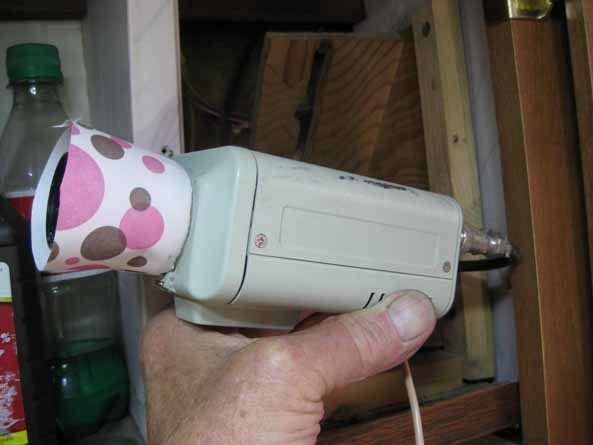 Be carfule as you must find the line that is fed by the INVERTER…That way you will always have 110 volts of AC available. I also placed some trim molding around the front of the box as it looked better. The box had about 1/2 “clearance all around and the molding covered this small space. No other changes were made. I do have my solar panel and all switching of power is the same as it was. It is a delight as the change had an unknown plus. The new box cools much more, is very consistent & we just turn it on and forget it. 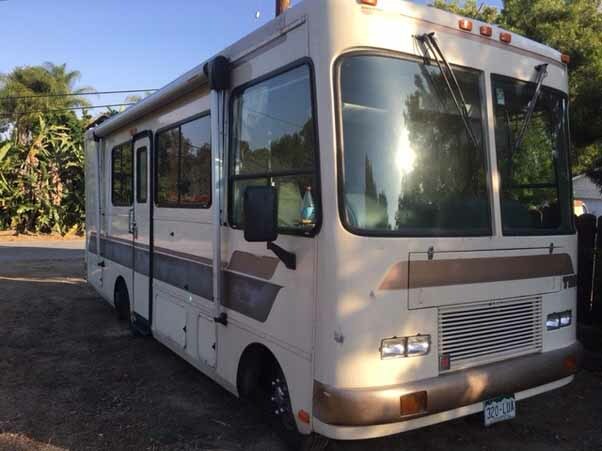 House boxes are very cheap compared to an RV style box, so this change will just cost you a few 100.00 dollars. I got my Avanti Energy efficient box on sale so I made out great. I made no other changes…You can do it too. I strongly recommend the change. 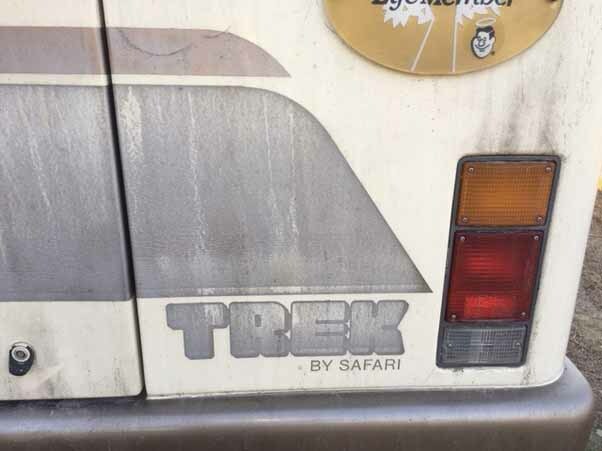 As you know, the early Isuzu Trek’s decals have not survived the “test of time” for many folks. My decals had not only faded, but peeled and became cracked and baked on from sun exposure. The good news is that the original factory paint has held up very well over time which meant that only the decals needed replacement. Instead of having custom decals made, I opted to have the old ones removed and new ones painted on. 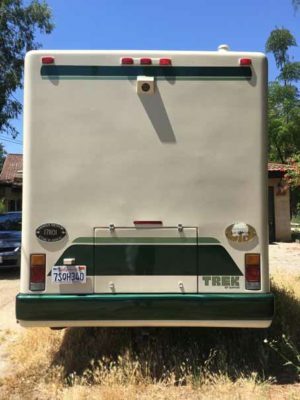 I found a local RV paint and body shop, Yanez Rv in Hemet CA, that removed all of the old decals with a rubber wheel. 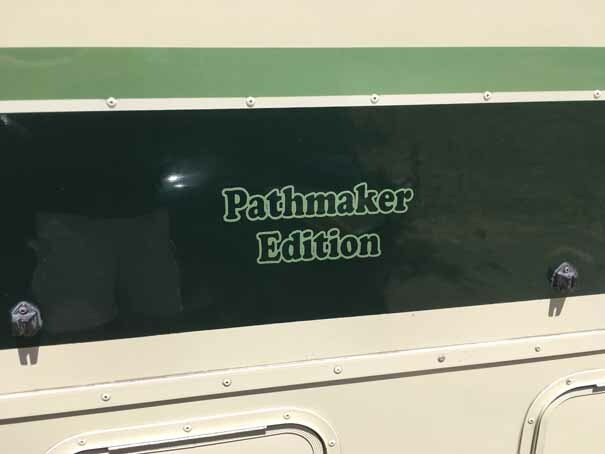 Then I provided them with decals of the original Trek logo and “Pathmaker Edition” logo as well purchased from Northwest RV Supply which still stocks some of the older Safari decals. Yanez RV then went ahead and had paint stencils made of the logos. I opted for a color change from the original gold and brown to a two tone green which I prefer. 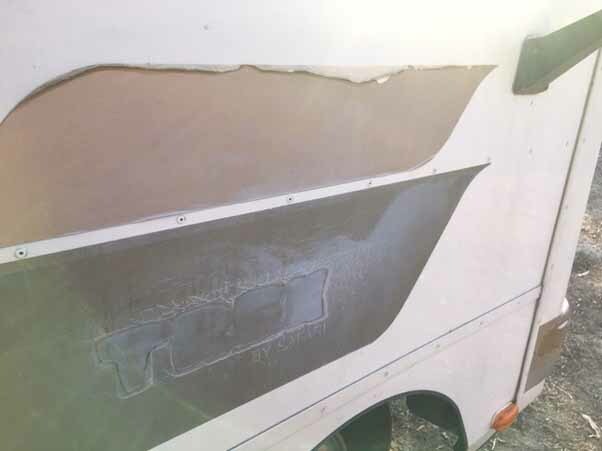 I then had Yanez RV apply their “Permaseal” roofing material and painted green. I’ve enclosed some before and after photos of the process. I think it has “taken years off” of the look of my Trek. 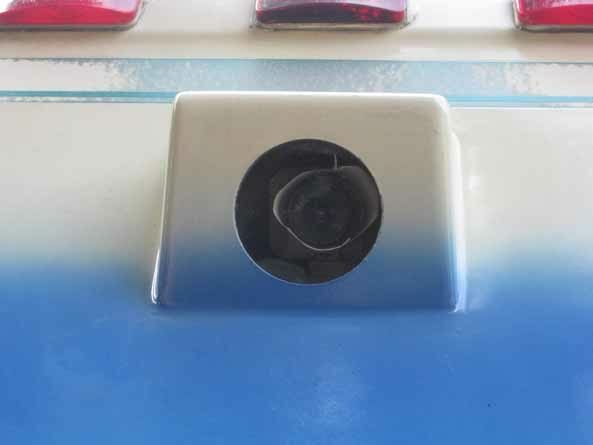 We have repeatedly had trouble with the inside of the rear view camera lens getting so dirty it obscured the view. The dust/dirt accumulation was fairly rapid especially when traveling Southwest gravel roads. Cleaning this was a bit of a pain as it required removal of the camera. Recently while accomplishing this procedure I concluded that sealing the area between the camera lens and the window should prevent the dust from accumulating. 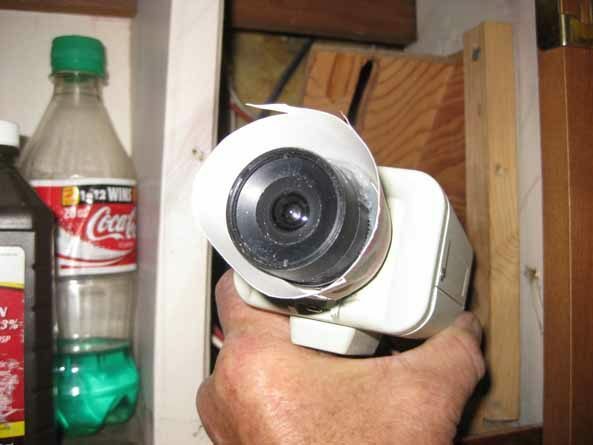 Right handy, since I was in the bathroom, was a bathroom size Dixie paper cup which, after the bottom was cut out, fit neatly over the camera lens and a little trimming where it met the window and suddenly, we have an extremely crude dust seal. We will see how it works and, if it is a benefit, maybe I will make it more sophisticated down the road. 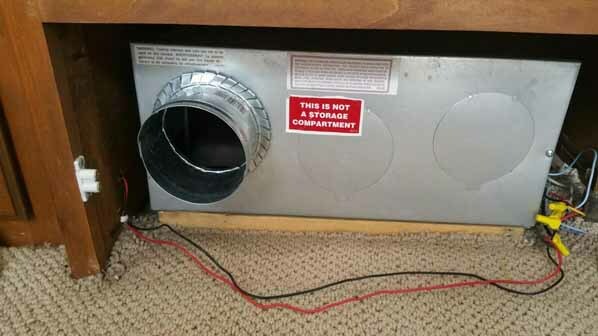 Editor’s Note: When making a ducting modification like this steps should be taken to insure that the hot air discharge from the new duct is not re-ingested to the furnace intake. Most intake air passes inward through the wood louvers up the right side of the cabinet (where the yellow wire nuts are in the photo. 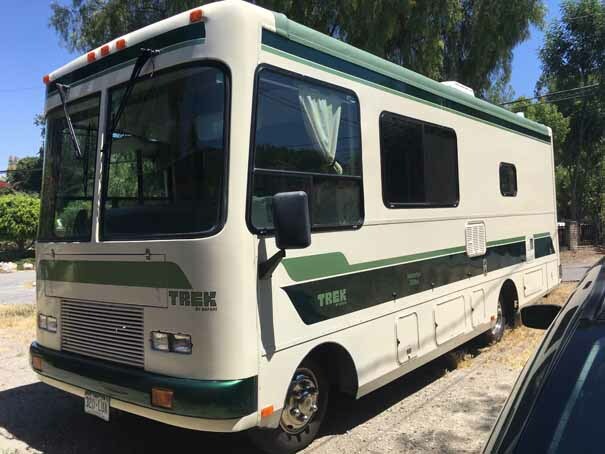 There are a million things I can say about my 1992 Isuzu Trek 26 feet with twin rear beds and magic bed. Ok, I bought it for a song in lower Alabama about a year ago. It had been parked for about 8 years. I couldn’t get it to run so we dragged it off to the junkyard, wrecker service, car collection, convenience store of a future friend. There I set up camp in a not running Trek with 68k miles on the clock. 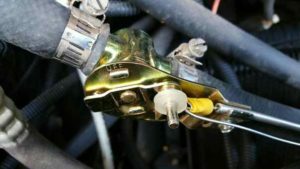 The engine was made to run easily … a microswitch on the front leveling leg was open (let shy of being fully retracted). I was able to start the engine using the control panel of the leveling system. So, i wired up the switch and the problem was solved. I got the rotten tires replaced with some good used ones …. not a good idea on the rear although I am still running the used front ones. I later replaced my rears with some $96 each Crosswind L780 LT215/85R16 from tires-easy.com. OK back to the spaceship – landed and broke down in lower Alabama. With it rolling, I drove it and I seemed to have only 2 forward gears in the transmission. I studied the factory manuals and conducted various experiments. I removed and cleaned the inhibitor switch. No change. I test drove it a few more times. On ONE 2 mile test, all the gears worked. I also noted that the ECO SWITCH was a lit green. But never again …. the next day etc it did not work. So I gradually repaired a bunch of stuff. It was sort of like being on an alien spaceship …. some things worked, some didn’t some I didn’t know how to operate. The alternator was bad, I replaced it. I changed the transmission fluid and filter and everything was clean as a whistle inside. So, I gave up in Alabama and limped 200 miles to New Orleans in second gear …on the backroads and camped in front of a friend’s uptown house. We gradually fixed some more things. 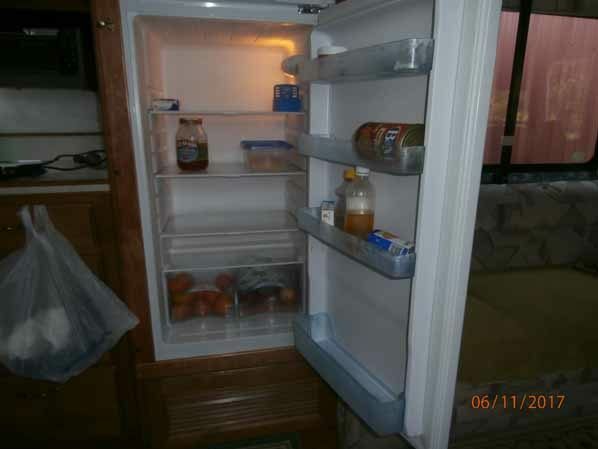 With a cleaning the refrigerator started running on gas. The water heater fired up. I still have not resolved the generator. It runs but quits under load. I borrowed a similar looking TCM from my 1991 Isuzu NPR truck. The Trek shifted all gears and has remained a smooth shifter for about 6,000 miles. So, a year later and 6,000 relatively trouble free miles later, I love my Trek. I used it to deliver and pick up antique letterpress printing presses ( www.ricktheprinter.com) that I refurbish and print on and sell. I drag the 1500 lb or more machines on a light trailer behind the trek. I expect to be running the Trek on WVO (waste used vegetable oil/cooking oil) some this summer. 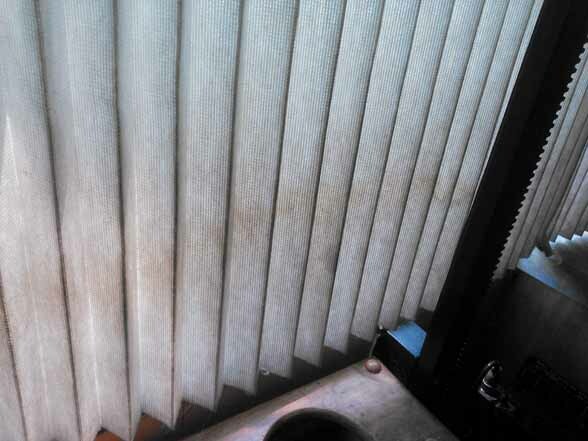 Still to repair … the GenSet, I have a stick in a hole in the water heater anode but am afraid to remove the anode due to rust on the tank fitting, I have some roof leaks …. 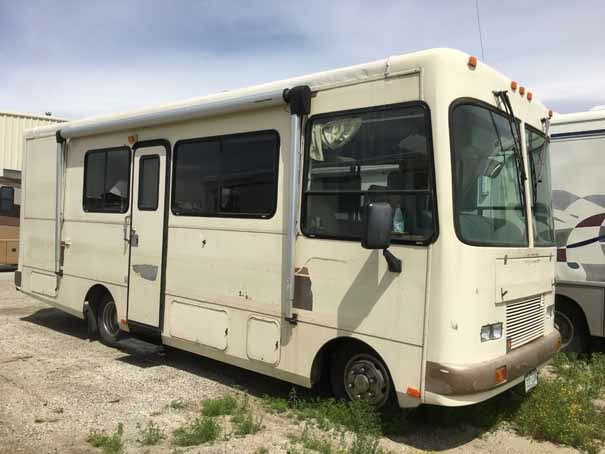 I have done some Dicor caulking that may have helped, I need to fix the cab air conditioner … the compressor is trashed …..the refrigerator door is bent or goofed and is leaky …. the external door into the Trek lost a bottom channel that I need to repair ….I have a leak in the sewage system … some pipe may have been dragged. 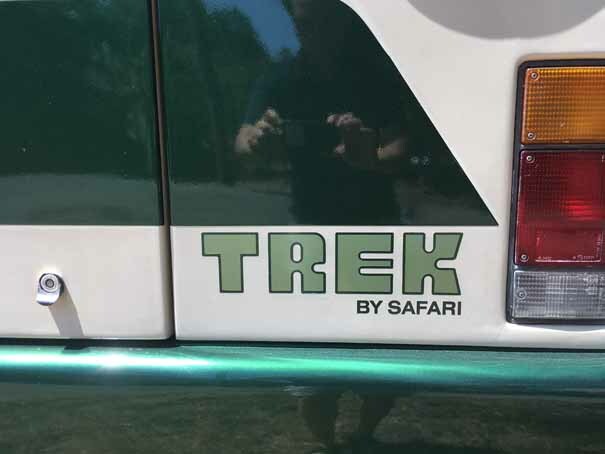 Would I get another Trek … absolutely an isuzu powered one. I went for the NPR chassis and am delighted with the house that came with it. Start saving your good stuff for the next Infoletter.